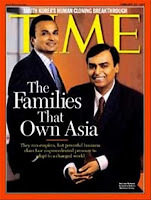 Investors of Indian Companies controlled by families are growing suspicious in the wake of the Satyam scandal involving the Raju brothers. Older brother Ramalinga Raju served as chairman and younger brother Ram Raju was managing director of Satyam. B. Ramalinga Raju admitted he had a fictitious cash balance of more than $1 billion on Satyam balance sheet and said in a letter of resignation that he overstated profits for the past several years, overstated the amount of debt owed to the company and understated liabilities. Eventually, he said, the scheme reached "simply unmanageable proportions" and he was left in a position that was "like riding a tiger, not knowing how to get off without being eaten." In the aftermath of the Satyam scandal described as "India's Enron", shares of the energy giant, Reliance Industries, controlled by one Ambani brother, are down 19%. The smaller listed Reliance units have likewise been punished in the market. Reliance Communications has tumbled nearly 28%. By contrast, Maruti Suzuki and Hindustan Unilever -- thanks to the foreign scrutiny their names imply -- are up 3.3% and 6.5%, respectively, from their close on Jan. 6. The 30-stock Bombay Stock Exchange Sensitive Index, by comparison, is down 12%, according to the Wall Street Journal. Indian government's handling of the crisis of confidence in publicly traded companies will hold the key to the nation remaining a preferred destination for investors. Their swift move to fire and replace Satyam's board of directors -- and the announcement by SEBI, the Securities and Exchange Board of India, that it will start reviewing auditors' work -- are steps aimed at restoring investor confidence. One measure of how investors respond could come on Tuesday when Infosys Technologies -- considered a model of good governance in India -- announces its fiscal third-quarter earnings. Whether shareholders' attention reverts to pure numbers or stays on the scrutiny of the quality of earnings will reveal much about how lasting this post-Satyam focus on governance will be. I would consider these things as slip not a fall. for example 1992 saw the highest level of stock market related fraud. However that paved way for national depositories which totally removed the paper from the system. paper settlement is literally zero and it is much superior than most of the developemtn countries liek usa's dtc. Second aspect is the market keening tracking the company to seek uncomfortable quesiton is the success of this story before it could have gone to greater levels like lehmen. You are probably right--this scandal alone is likely to be short-term wrinkle if handled well by regulators to instill confidence. However, the bigger problem is likely to be the highly inflated expectations of profits and growth. ^^^RH: "What it means is that even if the Indian economy continues to do well over the next two decades, GDP would have to more than double for the market cap to return to its previous heights without an equities bubble. If the economy keeps growing at 7.2%, that doubling would take at least ten years. There is a major flaw here. The stock indices are in INR. The Cap/GDP numbers are calculated using INR. Therefore, it is the NOMINAL growth in the GDP that is of importance. So if their economy grows at a REAL 7% average rate over the next 10 years, and they have an average INR inflation of 7%, then their NOMINAL GDP will grow at 14% and be 4-times the size it is today in 10 years. So it is always NOMINAL GDP that we must track. EXAMPLE: Since you wrote your comment, (a) their market is back at its peak, but (b) the Cap/GDP ratio is still low. Why don't you do an update on this Jan 2009 article to show how all these things stand in now in Dec 2012?